Wisconsin is offering taxpayers a sales tax rebate based on the number of children in a family. To receive that rebate, however, taxpayers must register on a state website before June 30, 2018. 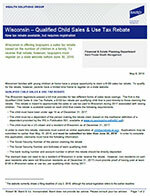 Wisconsin families with young children at home have a unique opportunity to claim a $100 sales tax rebate. To qualify for the rebate, however, parents have a limited time frame to register on a state website. The child must have been under age 18 as of December 31, 2017. The child must be a dependent of the person making the rebate claim (based on the traditional definition of a dependent provided by the IRS in Publication 501, available at www.irs.gov/pub/irs-pdf/p501.pdf). The child must be a US citizen and a resident of Wisconsin as of December 31, 2017. The Social Security Number of the person claiming the rebate. The Social Security Number and birthdate of each qualifying child. The bank routing number and account number in which the rebate should be directly deposited. 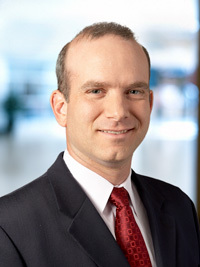 The claimant does not need to be a resident of Wisconsin in order receive the rebate. However, non-residents (or part-year residents who were not Wisconsin residents as of December 31, 2017) must provide proof of having paid at least $100 in Wisconsin sales or use tax, per qualifying child, during 2017. There are no income thresholds that apply to qualify for this rebate. All taxpayers with a qualifying child are eligible to apply. Only one person may claim a rebate for each child. In the case of divorced or separated parents, the person that claimed the child as a dependent on their 2017 tax return will qualify for the rebate. Children who are claimed as a dependent by a grandparent or other family member are qualifying children of that person. Children born in 2017 qualify for the credit, but not those born in 2018. Children that died in either 2017 or 2018 and who met the other requirements will also qualify for the rebate. Most rebates will be issued within three weeks of submitting the claim. A confirmation number will be provided when the claim is submitted. More information on this rebate is available from the Wisconsin Department of Revenue at www.revenue.wi.gov/Pages/FAQS/ise-ChildTaxRebate.aspx. Clothing with a price up to $75 per item. Computer purchased for the consumer’s personal use, up to $750. School computer supplies purchased for the consumer’s personal use, up to $250 per item. School supplies with a price up to $75 per item. More information is available on this sales tax holiday from the Wisconsin Department of Revenue at www.revenue.wi.gov/Pages/Individuals/SalesTaxHoliday.aspx. 1 The website currently shows a filing deadline of July 2, 2018, although the actual legislation refers to the earlier deadline. Baird does not provide tax advice. Please consult your tax advisor.